Things just got real serious. Let's start at the end- Jack Bauer may have been exposed to the deadly biological weapon that Jonas Hodges and his gun-toting crew arranged to smuggle into this country. No, Jack won't die, we can all safely take comfort in that fact. But Bauer is definitely hurt. And it will get worse as we learn more of his condition next week. I'm freaking out a little to be honest. But damn, this is awesome television. There is a great moment that happens in tonight's episode that I think elevates this season far past Day 6- where Jack and Tony are setting up their ambush of Starkwood's crew (headed by the formidable newcomer Stokes). As Jack and Tony are about to stop the bad guys, Bauer sees an opportunity to save the Port Authority guard that unwittingly got himself involved in the terrorist plot. And the ghosts that haunt our hero (Chase Edmunds, Ryan Chappelle and Buchanan to name a few) push him to make the tactically incorrect decision in order to save the guard's life. For too long, Jack has been making the mathematical tradeoffs- letting one person die to save hundreds, etc. In a TV show, it's easy for the audience to accept those moral justifications. But Bauer defies the correct course of action and instead makes the "right" choice- saving the guard despite the risks. Look, I'm not going to beat your heads with a 2 X 4 of morality or some other type of philosophical lumber. You either like that decision or you don't. I can see it from both sides of the argument. But either way, you have to give the writers credit for not making this a plain shoot 'em up tonight. I see Bauer changing as a result of this season's events. He's not so quick to sacrifice lives to win the day. As Senator Mayer alluded to last week- heroism is not always taking the most straightforward path. And maybe Jack is not a hero for selfishly doing the less repugnant thing, even if it risks thousands dying later. Tony certainly wasn't buying Jack's moral dilemma, but true to his nature he stuck by Jack and sacrificed his own safety. On the other side of this moral equation sits Jonas Hodges. He is willing to act in any way necessary to protect his interests. No life matters to Hodges. He is completely Machiavellian in his deeds. And the President's daughter, Olivia Taylor, to a less homicidal degree, is acting with the same disregard for others. There are moral choices being considered on "24." Tonight's episode reminded me of this show's unique value. Tonight's episode was full of win and surprising character growth. For the first time, I found myself not hating Larry Moss. Of course, this is 24, so that just means he's five episodes from a heroic death just as we learn to like him. As for Jack, I'm sorry, I know we're supposed to be on pins and needles, but at this point I'm pretty sure Jack is immune to every kind of nerve agent and other bioweapon. He probably breathed in the mystery compound and exhaled it as harmless potpourri. The only bioweapon that can hurt Jack is Chuck Norris' tears. Brian, I love your comment. I have to agree with the post, and to extend it, I also thought the writers did a smart thing in actually giving Carl a subtext. I expected him to be either another guy who wouldn't talk or another guy who didn't have a clue. But Carl was in the middle, and he talked. It seemed very realistic to what a person would have done. I was very pleased with that aspect of tonight. I did find myself getting frustrated at the blowing up of the Senator Mayer thing into a Jack Bauer murder case on the evening news and the Olivia stuff. Is she the next Sherry Palmer? I still am very sad we lost Senator Mayer just as he was showing a human side and trying to reach through to Jack himself... which makes me agree with Brian in that by the time we start to like Larry Moss, he'll be taken away from us. Hmm. I was happy to see Larry Moss become part of the "solution" finally. I think that his coming around was believable too- seeing Mayer dead and thinking "What kind of bad guy are we up against?" I hope he continues to do the right thing moving forward. @Molly- Yeah, they made Carl human (great job by Colin Trinneer too). As for Olivia Taylor, I think her acts play into the President's overall story arc. By season's end, Allison Taylor is going to be a mess, I predict. How tragic a figure she'll be remains to be seen, but her own daughter's betrayals will be substantial when it's all over. 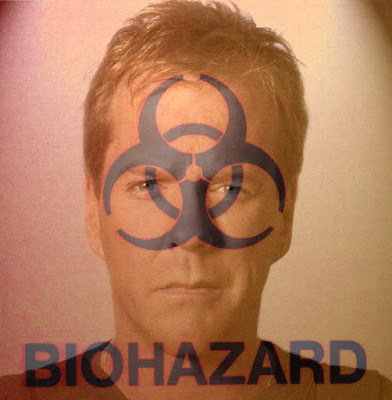 The biohazard sign on Jack's face kinda makes him look like Darth Maul, doesn't it? I have to admire your photoshopping skills, Adam. I really do. @ Ivan- that's Darth Bauer to you. @ TJ- Thank you very much. Do any of you have photoshop requests? Chase Edmunds never died, so he's not really a ghost. Chase's hand is dead- so it's like the Aadams Family. Chase's hand, Mike's eyes, Henderson's wife's leg, Aundrey's virginity. Oh, they all come at him at full force. 24 Season 7: The Silent Film! What If... Jack Bauer Asked For Bailout Money? 24 Season 7: Who Is Jonas Hodges? 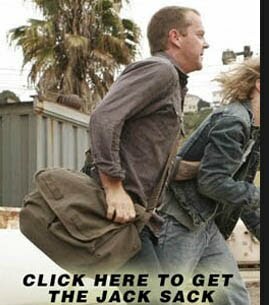 24 Season 7: Bill Buchanan, Reincarnated? Morris O'Brian: "This Slanket is #$*@ing Brill!"